Equipo Nizkor - CRS RL33640 - U.S. Strategic Nuclear Forces: Background, Developments, and Issues. Even though the United States is in the process of reducing the number of warheads deployed on its long-range missiles and bombers, consistent with the terms of the New START Treaty, it also plans to develop new delivery systems for deployment over the next 20-30 years. The 115th Congress will continue to review these programs, and the funding requested for them, during the annual authorization and appropriations process. During the Cold War, the U.S. nuclear arsenal contained many types of delivery vehicles for nuclear weapons. The longer-range systems, which included long-range missiles based on U.S. territory, long-range missiles based on submarines, and heavy bombers that could threaten Soviet targets from their bases in the United States, are known as strategic nuclear delivery vehicles. At the end of the Cold War, in 1991, the United States deployed more than 10,000 warheads on these delivery vehicles. That number has declined to less than 1,500 deployed warheads today, and is slated to be 1,550 deployed warheads in 2018, after the New START Treaty completes implementation. At the present time, the U.S. land-based ballistic missile force (ICBMs) consists of 414 land-based Minuteman III ICBMs, each deployed with one warhead. The fleet will decline to 400 deployed missiles, while retaining 450 launchers, to meet the terms of the New START Treaty. The Air Force is also modernizing the Minuteman missiles, replacing and upgrading their rocket motors, guidance systems, and other components, so that they can remain in the force through 2030. It plans to replace the missiles with a new Ground-based Strategic Deterrent around 2030. The U.S. ballistic missile submarine fleet currently consists of 14 Trident submarines; each can carry up to 24 Trident II (D-5) missiles, although they will carry only 20 under the New START Treaty. The Navy converted 4 of the original 18 Trident submarines to carry non-nuclear cruise missiles. The remaining carry around 1,000 warheads in total; that number will decline as the United States implements the New START Treaty. Nine of the submarines are deployed in the Pacific Ocean and five are in the Atlantic. The Navy also has undertaken efforts to extend the life of the missiles and warheads so that they and the submarines can remain in the fleet past 2020. It is designing a new Columbia class submarine that will replace the existing fleet beginning in 2031. The U.S. fleet of heavy bombers includes 20 B-2 bombers and 54 nuclear-capable B-52 bombers. The B-1 bomber is no longer equipped for nuclear missions. The fleet will decline to around 60 aircraft in coming years, as the United States implements New START. The Air Force has also begun to retire the nuclear-armed cruise missiles carried by B-52 bombers, leaving only about half the B-52 fleet equipped to carry nuclear weapons. The Air Force plans to procure both a new long-range bomber and a new cruise missile during the 2020s. DOE is also modifying and extending the life of the B61 bomb carried on B-2 bombers and fighter aircraft and the W80 warhead for cruise missiles. The Obama Administration completed a review of the size and structure of the U.S. nuclear force, and a review of U.S. nuclear employment policy, in June 2013. This review has advised the force structure that the United States will deploy under the New START Treaty. It is currently implementing the New START Treaty, with the reductions due to be completed by 2018. The Trump Administration has indicated that it will conduct a new review of the U.S. nuclear force posture. Congress will review the Administration's plans for U.S. strategic nuclear forces during the annual authorization and appropriations process, and as it assesses U.S. plans under New START and the costs of these plans in the current fiscal environment. This report will be updated as needed. During the Cold War, the U.S. nuclear arsenal contained many types of delivery vehicles for nuclear weapons, including short-range missiles and artillery for use on the battlefield, medium-range missiles and aircraft that could strike targets beyond the theater of battle, short- and medium-range systems based on surface ships, long-range missiles based on U.S. territory and submarines, and heavy bombers that could threaten Soviet targets from their bases in the United States. The short- and medium-range systems are considered non-strategic nuclear weapons and have been referred to as battlefield, tactical, and theater nuclear weapons. |1| The long-range missiles and heavy bombers are known as strategic nuclear delivery vehicles. This report reviews the ongoing programs that will affect the expected size and shape of the U.S. strategic nuclear force structure. It begins with an overview of this force structure during the Cold War, and summarizes the reductions and changes that have occurred since 1991. It then offers details about each category of delivery vehicle–land-based intercontinental ballistic missiles (ICBMs), submarine launched ballistic missiles (SLBMs), and heavy bombers–focusing on their current deployments and ongoing and planned modernization programs. The report concludes with a discussion of issues related to decisions about the future size and shape of the U.S. strategic nuclear force. Since the early 1960s the United States has maintained a "triad" of strategic nuclear delivery vehicles. The United States first developed these three types of nuclear delivery vehicles, in large part, because each of the military services wanted to play a role in the U.S. nuclear arsenal. However, during the 1960s and 1970s, analysts developed a more reasoned rationale for the nuclear "triad." They argued that these different basing modes had complementary strengths and weaknesses. They would enhance deterrence and discourage a Soviet first strike because they complicated Soviet attack planning and ensured the survivability of a significant portion of the U.S. force in the event of a Soviet first strike. |11| The different characteristics might also strengthen the credibility of U.S. targeting strategy. For example, ICBMs eventually had the accuracy and prompt responsiveness needed to attack hardened targets such as Soviet command posts and ICBM silos, SLBMs had the survivability needed to complicate Soviet efforts to launch a disarming first strike and to retaliate if such an attack were attempted, |12| and heavy bombers could be dispersed quickly and launched to enhance their survivability, and they could be recalled to their bases if a crisis did not escalate into conflict. According to unclassified estimates, the number of delivery vehicles (ICBMs, SLBMs, and nuclear-capable bombers) in the U.S. force structure grew steadily through the mid-1960s, with the greatest number of delivery vehicles, 2,268, deployed in 1967. |13| The number then held relatively steady through 1990, at between 1,875 and 2,200 ICBMs, SLBMs, and heavy bombers. The number of warheads carried on these delivery vehicles increased sharply through 1975, then, after a brief pause, again rose sharply in the early 1980s, peaking at around 13,600 warheads in 1987. Figure 1 displays the increases in delivery vehicles and warheads between 1960, when the United States first began to deploy ICBMs, and 1990, the year before the United States and Soviet Union signed the first Strategic Arms Reduction Treaty (START). Source: Natural Resources Defense Council, Archive of Nuclear Data. 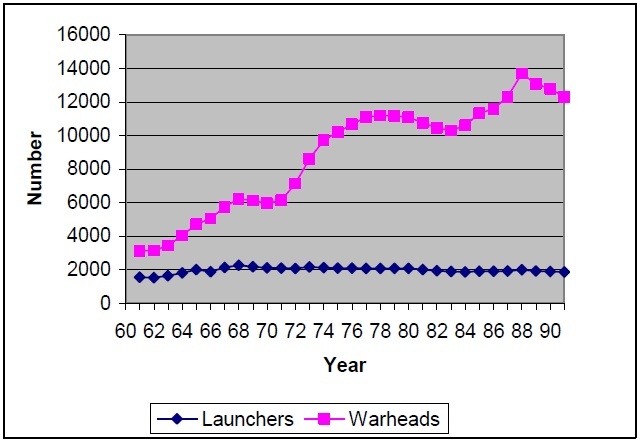 The sharp increase in warheads in the early 1970s reflects the deployment of ICBMs and SLBMs with multiple warheads, known as MIRVs (multiple independent reentry vehicles). In particular, the United States began to deploy the Minuteman III ICBM, with 3 warheads on each missile, in 1970, and the Poseidon SLBM, which could carry 10 warheads on each missile, in 1971. |14| The increase in warheads in the mid-1980s reflects the deployment of the Peacekeeper (MX) ICBM, which carried 10 warheads on each missile. In 1990, before it concluded the START Treaty with the Soviet Union, the United States deployed a total of around 12,304 warheads on its ICBMs, SLBMs, and heavy bombers. The ICBM force consisted of single-warhead Minuteman II missiles, 3-warhead Minuteman III missiles, and 10-warhead Peacekeeper (MX) missiles, for a total force of 2,450 warheads on 1,000 missiles. The submarine force included Poseidon submarines with Poseidon C-3 and Trident I (C-4) missiles, and the Ohio-class Trident submarines with Trident I, and some Trident II (D-5) missiles. The total force consisted of 5,216 warheads on around 600 missiles. |15| The bomber force centered on 94 B-52H bombers and 96 B-1 bombers, along with many of the older B-52G bombers and 2 of the new (at the time) B-2 bombers. This force of 260 bombers could carry over 4,648 weapons. During the 1990s, the United States reduced the numbers and types of weapons in its strategic nuclear arsenal, both as a part of its modernization process and in response to the limits in the 1991 START Treaty. The United States continued to maintain a triad of strategic nuclear forces, however, with warheads deployed on ICBMs, SLBMs, and bombers. According to the Department of Defense, this mix of forces not only offered the United States a range of capabilities and flexibility in nuclear planning and complicated an adversary's attack planning, but also hedged against unexpected problems in any single delivery system. This latter issue became more of a concern in this time period, as the United States retired many of the different types of warheads and missiles that it had deployed over the years, reducing the redundancy in its force. The 1991 START Treaty limited the United States to a maximum of 6,000 total warheads, and 4,900 warheads on ballistic missiles, deployed on up to 1,600 strategic offensive delivery vehicles. However, the treaty did not count the actual number of warheads deployed on each type of ballistic missile or bomber. Instead, it used "counting rules" to determine how many warheads would count against the treaty's limits. For ICBMs and SLBMs, this number usually equaled the actual number of warheads deployed on the missile. Bombers, however, used a different system. Bombers that were not equipped to carry air-launched cruise missiles (the B-1 and B-2 bombers) counted as one warhead; bombers equipped to carry air-launched cruise missiles (B-52 bombers) could carry 20 missiles, but would only count as 10 warheads against the treaty limits. These rules have led to differing estimates of the numbers of warheads on U.S. strategic nuclear forces during the 1990s; some estimates count only those warheads that count against the treaty while others count all the warheads that could be carried by the deployed delivery systems. According to the data from the Natural Resources Defense Council, the United States reduced its nuclear weapons from 9,300 warheads on 1,239 delivery vehicles in 1991 to 6,196 warheads on 1,064 delivery vehicles when it completed the implementation of START in 2001. By 2009, the United States had reduced its forces to approximately 2,200 warheads on around 850 delivery vehicles. According to the State Department, as of December 2009, the United States had 1,968 operationally deployed warheads on its strategic offensive nuclear forces. |16| NRDC estimated that these numbers held steady in 2010, prior to New START's entry into force, then began to decline again, falling to around 1,900 warheads on around 850 delivery vehicles by early 2015, as the United States began to implement New START (this total includes weapons that the State Department does not count in the New START force). |17| These numbers appear in Figure 2. Source: Natural Resources Defense Council, Archive of Nuclear Data, Bulletin of Atomic Scientists, Nuclear Notebook. During the 1990s, the United States continued to add to its Trident fleet, reaching a total of 18 submarines. It retired all of its remaining Poseidon submarines and all of the single-warhead Minuteman II missiles. It continued to deploy B-2 bombers, reaching a total of 21, and removed some of the older B-52G bombers from the nuclear fleet. Consequently, in 2001, its warheads were deployed on 18 Trident submarines with 24 missiles on each submarine and 6 or 8 warheads on each missile; 500 Minuteman III ICBMs, with up to 3 warheads on each missile; 50 Peacekeeper (MX) missiles, with 10 warheads on each missile; 94 B-52H bombers, with up to 20 cruise missiles on each bomber; and 21 B-2 bombers with up to 16 bombs on each aircraft. The United States and Russia signed a second START Treaty in early 1993. Under this treaty, the United States would have had to reduce its strategic offensive nuclear weapons to between 3,000 and 3,500 accountable warheads. In 1994, the Department of Defense decided that, to meet this limit, it would deploy a force of 500 Minuteman III ICBMs with 1 warhead on each missile, 14 Trident submarines with 24 missiles on each submarine and 5 warheads on each missile, 76 B-52 bombers, and 21 B-2 bombers. The Air Force was to eliminate 50 Peacekeeper ICBMs and reorient the B-1 bombers to non-nuclear missions; the Navy would retire 4 Trident submarines (it later decided to convert these submarines to carry conventional weapons). The START II Treaty never entered into force, and Congress prevented the Clinton Administration from reducing U.S. forces unilaterally to START II limits. Nevertheless, the Navy and Air Force continued to plan for the forces described above, and eventually implemented those changes. Table 1 displays the forces the United States had deployed in 2001, after completing the START I reductions. It also includes those that it would have deployed under START II, in accordance with the 1994 decisions. Source: U.S. State Department and CRS estimates. a. Under START I, bombers that are not equipped to carry ALCMs count as one warhead, even if they can carry up 16 nuclear bombs; bombers that are equipped to carry ALCMs count as 10 warheads, even if they can carry up to 20 ALCMs. b. Although they still counted under START I, B-1 bombers are no longer equipped for nuclear missions. The Bush Administration did not specify how it would reduce the U.S. arsenal from around 6,000 warheads to the lower level of 2,200 operationally deployed warheads, although it did identify some force structure changes that would account for part of the reductions. Specifically, after Congress removed its restrictions, |21| the United States eliminated the 50 Peacekeeper ICBMs, reducing by 500 the total number of operationally deployed ICBM warheads. It also continued with plans to remove four Trident submarines from service, and converted those ships to carry non-nuclear guided missiles. These submarines would have counted as 476 warheads under the START Treaty's rules. These changes reduced U.S. forces to around 5,000 warheads on 950 delivery vehicles in 2006; this reduction appears in Figure 2. The Bush Administration also noted that two of the Trident submarines remaining in the fleet would be in overhaul at any given time. The warheads that could be carried on those submarines would not count against the Moscow Treaty limits because they would not be "operationally deployed." This would further reduce the U.S. deployed force by 200 to 400 warheads. On April 8, 2014, the Obama Administration released a report detailing the force structure that the United States would deploy under New START. |27| It indicated that, although the reductions would be complete by the treaty deadline of February 5, 2018, most of the reductions would come late in the treaty implementation period so that the plans could change, if necessary. Table 2 displays this force structure and compares it with estimates of U.S. operational strategic nuclear forces in 2010. This force structure is consistent with the statements and adjustments the Administration has made about deploying all Minuteman III missiles with a single warhead, retaining Trident submarines deployed in two oceans, and converting some number of heavy bombers to conventional-only missions. Source: U.S. Department of Defense, Report on Plan to Implement the Nuclear Force Reductions, Limitations, and Verification, Washington, DC, April 8, 2014.
a. Under this force the United States will retain 14 Trident submarines with 2 in overhaul. In accordance with the terms of New START, the United States will eliminate 4 launchers on each submarine, so that each counts as only 20 launchers. The United States will also retain all 450 Minuteman III launchers, although only 400 would hold deployed missiles. In the late 1980s, the United States deployed 50 Peacekeeper ICBMs, each with 10 warheads, at silos that had held Minuteman missiles at F.E. Warren Air Force Base in Wyoming. The 1993 START II Treaty would have banned multiple warhead ICBMs, so the United States would have had to eliminate these missiles while implementing the treaty. Therefore, the Pentagon began planning for their elimination, and the Air Force added funds to its budget for this purpose in 1994. However, beginning in FY1998, Congress prohibited the Clinton Administration from spending any money on the deactivation or retirement of these missiles until START II entered into force. The Bush Administration requested $14 million in FY2002 to begin the missiles' retirement; Congress lifted the restriction and authorized the funding. The Air Force began to deactivate the missiles in October 2002, and completed the process, having removed all the missiles from their silos, in September 2005. The MK21 reentry vehicles and W87 warheads from these missiles have been placed in storage. As is noted below, the Air Force plans to redeploy some of these warheads and reentry vehicles on Minuteman III missiles, under the Safety Enhanced Reentry Vehicle (SERV) program. Under the terms of the original, 1991 START Treaty, the United States would have had to eliminate the Peacekeeper missile silos to remove the warheads on the missiles from accountability under the treaty limits. However, the Air Force retained the silos as it deactivated the missiles. Therefore, the warheads that were deployed on the Peacekeeper missiles still counted under START, even though the missiles were no longer operational, until START expired in December 2009. The United States did not, however, count any of these warheads under the limits in the Moscow Treaty. They also will not count under the limits in the New START Treaty, if the United States eliminates the silos. It will not, however, have to blow up or excavate the silos, as it would have had to do under the original START Treaty. The New START Treaty indicates that the parties can use whatever method they choose to eliminate the silos, as long as they demonstrate that the silos can no longer launch missiles. The Air Force filled the silos with gravel to eliminate them, and completed the process in February 2015. The U.S. Minuteman III ICBMs are located at three Air Force bases–F.E. Warren AFB in Wyoming, Malmstrom AFB in Montana, and Minot AFB in North Dakota. Each base houses 150 missiles. In testimony before the Senate Armed Services Committee, General Cartwright stated that the Air Force had decided to retire these missiles so that they could serve as test assets for the remaining force. He noted that the Air Force had to "keep a robust test program all the way through the life of the program." |31| With the test assets available before this decision, the test program would begin to run short around 2017 or 2018. The added test assets would support the program through 2025 or longer. This time line, however, raised questions about why the Air Force pressed to begin retiring the missiles in FY2007, 10 years before it would run out of test assets. Some speculated that the elimination of the 50 missiles was intended to reduce the long-term operations and maintenance costs for the fleet, particularly since the 564th Squadron used different ground control technologies and training systems than the remainder of the fleet. This option was not likely, however, to produce budgetary savings in the near term as the added cost of deactivating the missiles could exceed the reductions in operations and maintenance expenses. |32| In addition, to use these missiles as test assets, the Air Force has had to include them in the modernization programs described below. This has further limited the budgetary savings. When the Air Force decided to retire 50 ICBMs at Malmstrom, it indicated that it would retain the silos and would not destroy or eliminate them. However, with the signing of the New START Treaty in 2010, these silos added to the U.S. total of nondeployed ICBM launchers. The Air Force eliminated them in 2014, by filling them with gravel, so that the United States can comply with the New START limits by 2018. In a pattern that has become common over the years, Congress questioned the Administration's rationale for the plan to retire 50 Minuteman missiles, indicating that it believed that more Minuteman silos increased U.S. security and strengthened deterrence. In the FY2007 Defense Authorization Act (H.R. 5122, �139), Congress stated that DOD could not spend any money to begin the withdrawal of these missiles from the active force until the Secretary of Defense submitted a report that addressed a number of issues, including (1) a detailed justification for the proposal to reduce the force from 500 to 450 missiles; (2) a detailed analysis of the strategic ramifications of continuing to equip a portion of the force with multiple independent warheads rather than single warheads; (3) an assessment of the test assets and spares required to maintain a force of 500 missiles and a force of 450 missiles through 2030; (4) an assessment of whether halting upgrades to the missiles withdrawn from the deployed force would compromise their ability to serve as test assets; and (5) a description of the plan for extending the life of the Minuteman III missile force beyond FY2030. The Secretary of Defense submitted this report to Congress in late March 2007. Although the retirement of 50 Minuteman III missiles probably did little to reduce the cost of maintaining and operating the Minuteman fleet, this program did allow both STRATCOM and the Air Force to participate in the effort to transform the Pentagon in response to post-Cold War threats. These missiles may still have a role to play in U.S. national security strategy, but they may not be needed in the numbers that were required when the United States faced the Soviet threat. During 2012 and 2013, Congress sought to prevent the Administration from initiating an environmental assessment that would advise the possible elimination of up to 50 silos under New START. In addition, the House Armed Services Committee included a provision in its version of the FY2015 National Defense Authorization Act (H.R. 4435, �1634) that would require the Air Force to retain all 450 ICBM silos, regardless of future force structure requirements, budgets, or arms control limits, through 2015. The provision states that "it is in the national security interests of the United States to retain the maximum number of land-based strategic missile silos and their associated infrastructure to ensure that billions of dollars in prior taxpayer investments for such silos and infrastructure are not lost through precipitous actions which may be budget-driven, cyclical, and not in the long-term strategic interests of the United States." It requires that the Secretary of Defense "preserve each intercontinental ballistic missile silo ... in warm status that enables such silo to–(1) remain a fully functioning element of the interconnected and redundant command and control system of the missile field; and (2) be made fully operational with a deployed missile." In the April 2014 report on its planned force structure under New START, the Obama Administration indicated that it planned to retain 400 deployed Minuteman III ICBMs, within a total force of 450 deployed and nondeployed launchers. According to Air Force officials, this option would allow the Air Force to deactivate missiles in silos that have been damaged by water intrusion, repair those silos, and possibly return missiles to them at a later date while it repaired additional silos. If it had eliminated some of the empty silos, it would have had to do so in complete squadrons, regardless of the silos' conditions, and would not have been able to empty and repair the most degraded silos. |35| Congress has also weighed in on this force structure, again arguing that U.S. security would benefit from the retention of more operational ICBM launchers, even if they did not contain operational missiles. Each Minuteman III missile was initially deployed with 3 warheads, for a total of 1,500 warheads across the force. In 2001, to meet the START limit of 6,000 warheads, the United States removed 2 warheads from each of the 150 Minuteman missiles at F.E. Warren AFB, |37| reducing the Minuteman III force to 1,200 total warheads. In the process, the Air Force also removed and destroyed the "bulkhead," the platform on the reentry vehicle, so that, in accordance with START rules, these missiles can no longer carry three warheads. Unlike under START, the United States did not have to alter the front end of the missile or remove the old bulkhead. As a result, the United States could restore warheads to its ICBM force if the international security environment changed. Moreover, this plan could have changed, if, in an effort to reduce the cost of the ICBM force under New START, the Administration had decided to reduce the number of Minuteman III missiles further in the coming years. Reports indicate that the Pentagon may have reviewed such an option as a part of its NPR implementation study, but, as the report released on April 8, 2014, indicated, it did not decide to pursue this approach. As a result, under New START, each of the 400 deployed Minuteman III missiles will carry a single warhead. Over the past 15 years, the Air Force pursued several programs that are designed to improve the accuracy and reliability of the Minuteman fleet and to "support the operational capability of the Minuteman ICBM through 2030." According to some estimates, this effort will likely cost $6 billion-$7 billion. |44| This section describes several of the key programs in this effort. The program began in 1998 and has been replacing the propellant, the solid rocket fuel, in the Minuteman motors to extend the life of the rocket motors. A consortium led by Northrup Grumman poured the new fuel into the first and second stages and remanufactured the third stages of the missiles. According to the Air Force, as of early August, 2007, 325 missiles, or 72% of the fleet, had completed the PRP program; this number increased to around 80% by mid-2008. The Air Force purchased the final 56 booster sets, for a total of 601, with its funding in FY2008. Funding in FY2009 supported the assembly of the remaining boosters. The Air Force completed the PRP program in 2013. |45| In the FY2007 Defense Authorization Act (P.L. 109-364) and the FY2007 Defense Appropriations Act (P.L. 109-289), the 109th Congress indicated that it would not support efforts to end this program early. However, in its budget request for FY2010, the Air Force indicated that FY2009 was the last year for funding for the program, as the program was nearing completion. The Guidance Replacement Program has extended the service life of the Minuteman missiles' guidance set, and improved the maintainability and reliability of guidance sets. It replaced aging parts with more modern and reliable technologies, while maintaining the accuracy of the missiles. |46| Flight testing for the new system began in 1998, and, at the time, it exceeded its operational requirements. Production began in 2000, and the Air Force purchased 652 of the new guidance units. Press reports indicate that the system had some problems with accuracy during its testing program. |47| The Air Force eventually identified and corrected the problems in 2002 and 2003. According to the Air Force, 425 Minuteman III missiles were upgraded with the new guidance packages as of early August 2007. The Air Force had been taking delivery of 5 to 7 new guidance units each month, for a total of 652 units. Boeing reported that it had delivered the final guidance set in early February 2009. The Air Force did not request any additional funding for this program in FY2010. However, it did request $1.2 million in FY2011 and $0.6 million in FY2012 to complete the program. It has not requested additional funding in subsequent years. According to the Air Force, the Propulsion System Rocket Engine (PSRE) program is designed to rebuild and replace Minuteman post-boost propulsion system components that were produced in the 1970s. The Air Force has been replacing, rather than repairing this system because original replacement parts, materials, and components are no longer available. This program is designed to reduce the life-cycle costs of the Minuteman missiles and maintain their reliability through 2020. The Air Force plans to purchase a total of 574 units for this program. Through FY2009, the Air Force had purchased 441 units, at a cost of $128 million. It requested an additional $26.2 million to purchase another 96 units in FY2010 and $21.5 million to purchase 37 units in FY2011. This would complete the purchase of the units. As a result, the budget for FY2012 does not support the purchase of any additional units, but does include $26.1 million for continuing work installing the units. The FY2013 budget request contained $10.8 million for the same purpose. The Air Force has not requested additional funding in subsequent years. The REACT targeting system was first installed in Minuteman launch control centers in the mid-1990s. This technology allowed for a significant reduction in the amount of time it would take to retarget the missiles, automated routine functions to reduce the workload for the crews, and replaced obsolete equipment. |48| In 2006, the Air Force began to deploy a modernized version of this system to extend its service life and to update the command and control capability of the launch control centers. This program will allow for more rapid retargeting of ICBMs, a capability identified in the Nuclear Posture Review as essential to the future nuclear force. The Air Force completed this effort in late 2006. As was noted above, under the SERV program, the Air Force plans to deploy MK21/W-87 reentry vehicles removed from Peacekeeper ICBMs on the Minuteman missiles, replacing the older MK12/W62 and MK12A/W78 reentry vehicles. To do this, the Air Force must modify the software, change the mounting on the missile, and change the support equipment. According to Air Force Space Command, the SERV program conducted three flight tests in 2005 and cancelled a fourth test because the first three were so successful. |49| The Air Force installed 20 of the kits for the new reentry vehicles on the Minuteman missiles at F.E. Warren Air Force Base in 2006. The process began at Malmstrom in July 2007 and at Minot in July 2008. As of early August 2007, 47 missiles had been modified. The Air Force purchase an additional 111 modification kits in FY2009, for a total of 570 kits. This was the last year that it planned to request funding for the program. It completed the installation process by 2012. In the FY2009 Omnibus Appropriations Bill, Congress approved a new program known as the Solid Rocket Motor Warm Line Program. According to Air Force budget documents, this program was intended to "sustain and maintain the unique manufacturing and engineering infrastructure necessary to preserve the Minuteman III solid rocket motor production capability" by providing funding to maintain a low rate of production of motors each year. |51| The program received $42.9 million in FY2010 and produced motors for four Minuteman ICBMs. DOD requested $44.2 million to produce motors for three additional ICBMs in FY2011. The budget request for FY2012 includes an additional $34 million to complete work on the motors purchased in prior years. The FY2013 budget did not contain any additional funding for this program area, although the Air Force continues to support the solid rocket motor production base with work funded through its Dem/Val program (described below). According to DOD budget documents, the ICBM fuze modernization program will replace the current MK21 fuze to "meet warfighter requirements and maintain current capability through 2030." This program is needed because the current fuzes have long exceeded their original 10-year life span and the Strategic Command (STRATCOM) does not have enough fuzes available to meet its requirements. According to DOD, the Air force had initially expected to procure around 700 modernized fuzes for the Minuteman fleet. But the new fuzes will also be deployed on the missile that will eventually replace the Minuteman system–the Ground Based Strategic Deterrent (GBSD), which is discussed in more detail below–eventually leading to a much larger program as the Air Force plans to acquire nearly 650 new missiles. According to the Air Force FY2017 budget request, "the ICBM fuze modernization program will leverage technologies, parts, components, and development/production capabilities resulting from extensive fuze modernization work performed by the U.S. Navy and NNSA" in support of the modernization of a fuze used on submarine-launched ballistic missiles. The Air Force and Navy have been seeking to employ common fuze components, in an effort supported by Congress, to increase efficiency and reduce costs. According to the Air Force, some of the common components include the radar module, the thermal battery assembly, and the path length module. Other fuze components may also use common technologies. Funding for the fuze modernization program has begun to accelerate. The Air Force received $57.9 million for this program in FY2015 and $142 million in FY2016. It has requested $189.8 million for FY2017. Both the House and Senate included this amount in their versions of the FY2017 Defense Authorization Act; this funding was included in the final bill (P.L. 114-328). The budget documents indicate that funding will continue to exceed $150 million per year through FY2020, with a total program cost of $1.197 billion. In the area of propulsion applications, DOD is, among other things, "exploring improvements and/or alternatives to current propulsion systems." This program area is specifically seeking to support the solid rocket motor research and development industrial base, so that it will have the capacity to support the ICBM force when the Air Force begins the procurement of its new ground-based strategic deterrent. In the area of reentry vehicle applications, DOD is seeking to both support reentry systems beyond their original design life and develop and test advanced technologies to meet future requirements. The area of command and control applications "evaluates and develops assured, survivable, and secure communications and battlespace awareness." It is focusing on both skills and technologies needed to meet current and future requirements. In 2002, the Air Force began to explore its options for a new missile to replace the Minuteman III, with the intent to begin deploying a new missile in 2018. It reportedly produced a "mission needs statement" at that time, and then began an Analysis of Alternatives (AOA) in 2004. |54| In June 2006, General Frank Klotz indicated that, after completing the AOA, Air Force Space Command had decided to recommend "an evolutionary approach to the replacement of the Minuteman III capability," |55| which would continue to modernize the components of the existing missiles rather than begin from scratch to develop and produce new missiles. He indicated that Space Command supported this approach because it would be less costly than designing a new system "from scratch." At the same time, the Air Force has begun to consider what a follow-on system to the Minuteman III might look like for the timeframe after 2030. The Air Force began a capabilities-based assessment of its land-based deterrent in early 2011 and began a new Analysis of Alternatives (AOA) for the ICBM force in 2012 with completion expected in mid-2014. |58| According to the Air Force, it requested $2.6 million to begin the study in the FY2012 budget. The FY2013 budget request included $11.7 million for a new project area known as Ground-based Strategic Deterrence (GBSD). According to the Air Force, this effort, which was previously funded under Long-Range Planning, included funding to begin the Analysis of Alternatives (AOA). The FY2014 budget request included $9.4 million to continue this study. In early January 2013, the Air Force Nuclear Weapons Center issued a "Broad Agency Announcement (BAA)" seeking white papers for concepts "that address modernization or replacement of the ground-based leg of the nuclear triad." The papers produced as a part of this study served as an early evaluation of alternatives for the future of the ICBM force, and may have helped select those concepts that will be included in the formal Analysis of Alternatives. According to the BAA, the Air Force Nuclear Weapons Center created five possible paths for further analysis. These include one that would continue to use the current Minuteman III baseline until 2075 without seeking to close gaps in the missiles' capabilities, one that would incorporate incremental changes into the current Minuteman III system to close gaps in capabilities, one that would design a new, fixed ICBM system to replace the Minuteman III, one that would design a new mobile ICBM system, and one that would design a new tunnel-based system. Some analysts have expressed surprise at the possibility that the Air Force would consider deploying a new ICBM on mobile launchers or in tunnels. During the Cold War, the Air Force considered these types of deployment concepts as a way to increase the survivability of the ICBM force when faced with possibility of an attack with hundreds, or thousands, of Soviet warheads. Even during the Cold War, these concepts proved to be very expensive and impractical, and they were dropped from consideration after the demise of the Soviet Union and in the face of deep reductions in the numbers of U.S. and Russian warheads. Some analysts see the Air Force's possible renewed interest in these concepts as a step backward; they argue that the United States should consider retiring its ICBM force, and should not consider new, expensive schemes to increase the missiles' capabilities. Others, however, note that the presence of these concepts in the study does not mean that the Air Force will move in this direction. They note that the 2010 NPR mentioned the possibility of mobile basing for ICBMs as a way to increase warning and decision time, so it should not be a surprise to see requests for further study. However, the cost and complexity of mobile ICBM basing may again eliminate these concepts from further consideration. However, in recent documents, the Air Force has indicated that the GBSD program "will replace the entire flight system, retaining the silo basing mode while recapitalizing the ground facilities." While this seemed to indicate that there will be a greater level of effort to modernize the silos and launch control facilities, it did not resolve questions about whether the Air Force will continue to retain the option of deploying the missiles on mobile launchers and how much such an option might cost. Nevertheless, there seem to be some indications that the cost of such an option might be prohibitive, and that the priority is on designing a new missile that would be deployed in fixed silos, although mobile launch control facilities remain a possibility. The Air Force received $75 million for the GBSD program in FY2016 and has requested $113 million for FY2017. The House and Senate both included this level of funding in their versions of the 2017 Defense Authorization Bills; this funding was included in the final bill (P.L. 114-328). DOD budget documents indicate that DOD expects to spend an additional $3.2 billion between FY2018 and FY2021. According to press reports, the Air Force estimated, in 2015, that the program would cost a total of $62.3 billion, in then-year dollars, over 30 years. This includes $48.5 billion for the acquisition of 642 missiles, $6.9 billion for command and control systems, and $6.9 billion to renovate the launch control centers. |60| The 642 missiles would support testing and deployment of a force of 400 missiles. According to DOD budget documents, the Air Force is seeking to deliver "an integrated flight system" beginning in FY2028, with booster production beginning in FY2026. Press reports indicate that the system would reach its initial operational capacity, with 9 missiles on alert, by 2029 and would complete the deployment with 400 missiles on alert in 2036. |63| The Air Force, however, plans to install new command and control systems in all 450 existing launch silos by 2037. By the early 1990s, the United States had completed the deployment of 18 Trident ballistic missile submarines (SSBNs). Each of these submarines was equipped to carry 24 Trident missiles, and each missile could carry up to 8 warheads (either W-76 warheads or the larger W-88 warheads on the Trident II missile). The Navy initially deployed eight of these submarines at Bangor, WA, and all eight were equipped with the older Trident I missile. It then deployed 10 submarines, all equipped with the Trident II missile, at Kings Bay, GA. During the 1994 Nuclear Posture Review, the Clinton Administration decided that the United States would reduce the size of its Trident fleet to 14 submarines, and that 4 of the older submarines would be "backfit" to carry the Trident II missile. The Bush Administration's 2001 Nuclear Posture Review endorsed the plan to backfit four of the Trident submarines so that all would carry Trident II missiles. It also indicated that, instead of retiring the remaining four submarines, the Navy would convert them to carry conventional weapons, and designated them "guided missile" submarines (SSGNs). The 2010 NPR also endorsed a force of 14 Trident submarines, although it noted that it might reduce that force to 12 submarines in the latter half of this decade. As was noted above, each submarine will deploy with only 20 missiles to meet the reductions in New START. As a result, the U.S. ballistic missile submarine (SSBN) force may continue to consist of 14 Trident submarines, with 2 in overhaul, through New START implementation. The first two submarines scheduled for this conversion were removed from the nuclear fleet in early 2003. They were slated to receive their engineering overhaul, then to begin the conversion process in 2004. |67| The first to complete the process, the USS Ohio returned to service as an SSGN in January 2006 |68| and achieved operational status on November 1, 2007. According to the Navy, the Georgia was scheduled for deployment in March 2008, and the other submarines were scheduled to reach that status later in the year. |69| According to Admiral Stephen Johnson, the Director of the Navy's Strategic Submarine Program (SSP), all four of the submarines had returned to service by mid-2008, and two were forward-deployed on routine patrols. According to the Navy, these submarines are likely to remain in service through the mid-2020s. As was noted above, both the 1994 and 2001 Nuclear Posture Reviews confirmed that the Navy would backfit four Trident submarines so that they could carry the newer Trident II (D-5) missile. This process not only allowed the Navy to replace the aging C-4 missiles, it also equipped the fleet with a missile that has improved accuracy and a larger payload. With its greater range, it would allow the submarines to operate in a larger area and cover a greater range of targets. These characteristics were valued when the system was designed and the United States sought to enhance its ability to deter the Soviet Union. The Bush Administration believed that the range, payload, and flexibility of the Trident submarines and D-5 missiles remained relevant in an era when the United States may seek to deter or defeat a wider range of adversaries. The Obama Administration has emphasized that, by providing the United States with a secure second strike capability, these submarines enhance strategic stability. Four of the eight Trident submarines based in Bangor, WA (USS Alaska, USS Nevada, USS Henry M. Jackson, and USS Alabama) were a part of the backfit program. The Alaska and Nevada both began the process in 2001; the Alaska completed its backfit and rejoined the fleet in March 2002 and the Nevada did the same in August 2002. During the process, the submarines underwent a pre-planned engineered refueling overhaul, which accomplishes a number of maintenance objectives, including refueling of the reactor, repairing and upgrading some equipment, replacing obsolete equipment, repairing or upgrading the ballistic missile systems, and other minor alterations. |70| The submarines also are fit with the Trident II missiles and the operating systems that are unique to these missiles. According to the Navy, both of these efforts came in ahead of schedule and under budget. The Henry M. Jackson and Alabama were completed their engineering overhaul and backfit in FY2006 and reentered the fleet in 2007 and 2008. When the Navy first decided, in the mid-1990s, to maintain a Trident fleet with 14 submarines, it planned to "balance" the fleet by deploying 7 Trident submarines at each of the 2 Trident bases. The Navy would have transferred three submarines from Kings Bay to Bangor, after four of the submarines from Bangor were removed from the ballistic missile fleet, for a balance of seven submarines at each base. However, these plans changed after the Bush Administration's Nuclear Posture Review. The Navy has transferred five submarines to Bangor, "balancing" the fleet by basing nine submarines at Bangor and five submarines at Kings Bay. Because two submarines would be in overhaul at any given time, this basing plan means that seven submarines would be operational at Bangor and five would be operational at Kings Bay. According to unclassified reports, the Navy began moving Trident submarines from Kings Bay to Bangor in 2002, and transferred the fifth submarine in September 2005. |72| This change in basing pattern apparently reflected changes in the international security environment, with fewer targets within range of submarines operating in the Atlantic, and a greater number of targets within range of submarines operating in the Pacific. In particular, the shift allows the United States to improve its coverage of targets in China and North Korea. |73| Further, as the United States modifies its nuclear targeting objectives it could alter the patrol routes for the submarines operating in both oceans, so that a greater number of emerging targets would be within range of the submarines in a short amount of time. During the George W. Bush Administration, the Navy further reduced the number of warheads on the Trident submarines so that the United States could reduce its forces to the 2,200 deployed warheads permitted under the 2002 Moscow Treaty. The United States did not have to reach this limit until 2012, but it had done so by 2009. The United States may continue to reduce the total numbers of warheads carried on its Trident missiles under the New START Treaty. Unlike START, which attributed the same number of warheads to each missile of a given type, regardless of whether some of the missiles carried fewer warheads, the United States can deploy different numbers of warheads on different missiles, and count only the actual warheads deployed on the force. This will allow each missile to be tailored to meet the mission assigned to that missile. The United States does not need to indicate how many warheads are deployed on each missile at all times; it must simply report the total number of operationally deployed warheads on all of its strategic nuclear delivery vehicles. The parties will, however, have opportunities to confirm that actual number on a specific missile, with random, short-notice inspections. Moreover, the United States will not have to alter the platforms in the missiles, so it could restore warheads to its Trident missiles if circumstances changed. The Navy initially planned to keep Trident submarines in service for 30 years, but then extended that time period to 42 years. This extension reflects the judgment that ballistic missile submarines would have operated with less demanding missions than attack submarines, and could, therefore, be expected to have a much longer operating life than the expected 30-year life of attack submarines. Therefore, since 1998, the Navy has assumed that each Trident submarine would have an expected operating lifetime of at least 42 years, with two 20-year operating cycles separated by a 2-year refueling overhaul. |75| With this schedule, the submarines will begin to retire from the fleet in 2027. The Navy has also pursued a number of programs to ensure that it has enough missiles to support this extended life for the submarines. The Navy purchased 437 Trident II (D-5) missiles through FY2008, and planned to purchase an additional 24 missiles per year through FY2012, for a total force of 533 missiles. It continued to produce rocket motors, at a rate of around one per month, and to procure alternation kits (known as SPALTs) needed to meet the extended service life of the submarine. Although the Navy plans to deploy its submarines with only 240 ballistic missiles under New START, it needs the greater number of missiles to support the fleet throughout the their life-cycle. In addition, around 50 of the Trident missiles are available for use by Great Britain in its Trident submarines. The remainder would support the missile's test program throughout the life of the Trident system. The Navy allocated $5.5 billion to the Trident II missile program in FY2008 and FY2009. This funding supported the purchase of an additional 36 Trident II missiles. The Navy spent $1.05 billion on Trident II modifications in FY2010 and requested $1.1 billion in FY2011. In FY2010, $294 million was allocated to the purchase of 24 new missiles, $154.4 million was allocated to missile support costs, and $597.7 million was allocated to the Trident II Life Extension program. In FY2011, the Navy requested $294.9 million for the purchase of 24 new missiles, $156.9 million to missile support costs, and $655.4 million to the Trident II Life Extension Program. The FY2012 budget included $1.3 billion for Trident II missile program. Within this total, $191 million was allocated to the purchase of 24 additional new missiles, $137.8 million was allocated to missile support costs, and $980 million was allocated to the Trident II Life Extension Program. This was the last year during which the Navy sought to purchase new Trident II missiles. The FY2013 budget requested $1.2 billion for the Trident II missile program. This total included $524 million for program production and support costs, and $700.5 million for the Trident II life extension program. The Navy requested $1.14 billion for this program area in FY2014. According to the Navy's budget documents, this allowed it to continue to purchase components, such as the alteration kits for the guidance and missile electronics systems and solid rocket motors for these missiles. The Navy received $1.17 billion for FY2015 and $1.1 billion for FY2016 for Trident II modifications. The Navy requested an additional $1.1 billion for FY2017. Both the House and the Senate included this funding in their versions of the 2017 Defense Authorization Bill. According to DOD budget documents, this funding supports the "redesign of the guidance system and missile electronics packages" and procures missile electronics, SPALT kits, and other critical components needed to support the missile through the service life of the Ohio submarines. Congress authorized this funding in the FY2017 National Defense Authorization Act (P.L. 114-328). The Navy plans to spend $4.8 billion on Trident II modifications between FY2018 and 2021. The overwhelming majority of Trident missiles are deployed with the MK4/W76 warhead, which, according to unclassified estimates, has a yield of 100 kilotons. |77| It is currently undergoing a life extension program (LEP) that is designed to enhance its capabilities. According to some reports, the Navy had initially planned to apply this program to around 25% of the W76 warheads, but has increased that plan to cover more than 60% of the stockpile. According to recent estimates, NNSA has delivered more than half of the planned units of the new W76 warheads, and expects to "complete at least 80% of the production units through FY2017." It expects to complete production in 2019. |78| The LEP is intended to add 30 years to the warhead life "by refurbishing the nuclear explosive package, the arming, firing, and fusing system, the gas transfer system, and associated cables, elastomers, valves, pads, cushions, foam supports, telemetries, and other miscellaneous parts." The FY2017 budget request for the Department of Energy includes $222.8 million for the W76 LEP. While most Trident II missiles carry W76 warheads, a portion of the fleet carries the W88 warhead. This warhead, the last to be added to the U.S. nuclear stockpile, entered the force in the late 1980s. According to DOE, this warhead is also in need of work to address concerns with its safety and reliability. In particular, according to recent testimony, the W88 warhead is in the "development engineering phase for Alteration (ALT) 370 to replace the aging arming, fuzing, and firing components." In August 2014, the Nuclear Weapons Council also decided to address potential problems with the warhead's conventional high explosive during the ALT 370 program. This program received $169.5 million in FY2014, $165.4 million in FY2015, and $220.1 million in FY2016. In its FY2016 budget request, NNSA indicated that the additional funding for this program will come from offsets generated by reducing sustainment activities and the quantities of stored warheads for some other types of warheads. In essence, NNSA "identified areas where increased risk could be accepted to produce cost-savings within the current program–without additional funding–and without additional delays to future work." |82| NNSA has requested $281.1 million for the W88 ALT 370 program in FY2017. According to NNSA budget documents, this program is scheduled to produce its first production unit (FPU) in 2020. The Navy is currently conducting development and design work on a new class of ballistic missile submarines, originally known as the SSBN(X) program and the Ohio Replacement Program (ORP). The Navy has recently announced that these submarines will be known as the Columbia class; they will replace the Ohio-class Trident submarines as they reach the end of their service lives. |83| The Trident submarines will begin to retire in 2027, and the Navy initially indicated that it would need the new submarines to begin to enter the fleet by 2029, before the number of Trident submarines falls below 12. |84| To do this, the Navy would have had to begin construction of its new submarine by 2019 so that it could begin to enter the fleet in 2029. |85| However, in the FY2013 budget request, the Navy delayed the procurement of the new class of submarines by two years. As a result, the first new submarine will enter the fleet in 2031 and the number of SSBNs in the fleet is expected to decline to 10 for most of the 2030s. The SSBN(X) program received $497.4 million in research and development funding in the Navy's FY2010 budget. The Navy requested an additional $672.3 million in research and development funding for the program in its FY2011 budget proposal. The FY2012 budget included $1.07 billion to develop the SSBN(X). It expected to request $927.8 million in FY2013, with the funding of $29.4 billion between 2011 and 2020. However, with the delay of two years in the procurement of the first SSBN(X), the Navy budgeted only $565 million for the program in FY2013. It then budgeted $1.1 billion for FY2014 and $1.2 billion in FY2015. It received an additional $1.39 billion in FY2016, with $971.4 million allocated to submarine development and $419.3 million allocated to power systems. The Navy has requested an additional $1.9 billion for the Ohio-replacement (ORP) in FY2017. Within this total, $700.1 million is allocated to submarine development and $390.3 million is allocated to nuclear power systems. The Navy has also requested $773.1 million for advanced procurement; this funding will support detailed design work in preparation for the beginning of construction. Both the House and the Senate authorized the requested levels of funding in their versions of the 2017 Defense Authorization Bill. The House, however, moved the $773.1 million for advanced procurement from the Navy's shipbuilding budget into the congressionally created National Sea-based Deterrent Fund (NSDF), which is described below. Congress approved the full funding requests in the FY2017 National Defense Authorization Act (P.L. 114-328), but did not transfer funding for advanced procurement to the NSDF. The Navy had planned to begin the detailed design for the submarine and to begin advanced procurement of critical components in FY2015, with the seven-year construction period for the first submarine beginning in FY2019. This timeline changed, in part to reduce near-term costs, but also to reduce risks in the program. With advanced procurement beginning in FY2017, the Navy plans to begin building the first hull in 2021. At the same time, it will continue to support the joint U.S./U.K. development of a common missile compartment, which both nations will use in their new SSBNs. A report published in late 2011 indicated that the Office of Management and Budget (OMB) suggested that the Navy reduce the number of SSBNs in the fleet to 10, but increase the number of launch tubes on each submarine to 20. |98| According to the OMB analysis, this could save the Navy $7 billion over the life of the fleet, by reducing acquisition costs and operating costs. It would not, however, undermine the submarines' mission because, with 20 missiles per submarine, the Navy would still be able to cover the full range of targets assigned to the Trident fleet. Analysts outside government have offered similar suggestions, noting that the Navy could save $27 billion over 10 years and $120 billion over the life of the fleet if the Navy built 8, rather than 12 submarines. |99| Moreover, according to this analysis, the Navy would be able to deploy the necessary number of warheads on these submarines, even if it did not increase the number of launch tubes, by deploying more warheads on each of the Trident missiles on the submarine. Generally, the number of launch tubes on the submarines should not affect the number of warheads carried by each submarine or the ability of the fleet to hold a range of potential targets at risk. Trident missiles can be equipped with 8 warheads each, but, in their current configuration, the missiles likely carry, on average, only 4 or 5 warheads each. This number might drop to 3-4 warheads per missile, on average, as the United States reduces to the levels in New START. If the new submarines carry only 16 missiles, rather than the 20 planned under New START, then they could deploy with 5-6 warheads per missile. In essence, the Navy would put the same number of warheads on each submarine, but would just spread them over a smaller number of missiles. The Navy has noted that, as the United States reduces its forces to New START levels, the lower number of missiles per submarine will allow the United States to retain a larger number of submarines, without exceeding the treaty's limit of 700 operational delivery vehicles. This will allow the Navy to maintain a fleet of 12 submarines, and to operate those submarines with continuous deployments from 2 bases. The Navy has argued that, if it reduces the numbers of submarines in the fleet, and alters its deployment patterns, it will not be able to meet its requirements, as these cover more than just the total number of warheads on the fleet or total number of warheads at sea at any time. Critics outside the government, however, question this approach, both because a fleet of 12 submarines will cost more to procure and operate than a fleet of only 8 submarines and because this fleet presumes that the United States must retain its current pattern of operations for the SSBN fleet for the next 50-60 years. With 12 submarines in the fleet, the Navy can maintain 4-5 on station at any time, patrolling in areas where they would need to be to launch their missiles promptly after a presidential order. But critics question whether this pattern, and the "continuous at-sea" deterrent of 4-5 submarines, will be necessary in the decades ahead. They note that the United States will be able to maintain a secure second strike deterrent on the submarines, even if they cannot launch as many warheads promptly as they can launch today. Others however, continue to support the current operational patterns, and to argue for a fleet of 12 submarines into the future. For example, Congress, in the FY2013 Defense Authorization Bill (P.L. 112-239, �130) stated that "the continuous at-sea deterrence provided by a robust and modern fleet of nuclear-powered ballistic missile submarines is critical to maintaining nuclear deterrence and assurance and therefore is a central pillar of the national security of the United States." The legislation went on to indicate that "a minimum of 12 replacement ballistic missile submarines are necessary to provide continuous at-sea deterrence over the lifetime of such submarines.... "
The Air Force began to deploy the B-1 bomber in the mid-1980s and eventually deployed a fleet of 96 aircraft. After several crashes, the Air Force was left with 92 bombers in 2001. It sought to retire 30 of the aircraft, leaving a force of 62 bombers, but that plan met resistance from Congress. The B-1 served exclusively as a nuclear delivery vehicle through 1991, carrying short-range attack missiles and gravity bombs. Because these bombers were not equipped to carry nuclear-armed air-launched cruise missiles, each counted as a single delivery vehicle and a single warhead under START. In 1993, the Air Force began to convert the B-1 bombers to carry conventional weapons. This process was completed in 1997 and the B-1 bomber is no longer equipped to carry nuclear weapons. In 2011, the United States displayed the bomber to the Russians, under the terms of the New START Treaty, to demonstrate that it was no longer equipped to deliver nuclear weapons and to confirm that it would not count under the limits in New START. The bomber has contributed to U.S. conventional operations in Afghanistan and Iraq. According to unclassified estimates, the United States has around 510 B61 and B83 bombs. |102| The B61 contains a number of different versions. The B61-7 serves as a strategic bomb and is carried by B-2 bombers. The B61 -3, 4, and 10 are considered nonstrategic bombs, with lower yields, and would be delivered by fighter aircraft like the F-16 and F-35. The B61-11, a modification developed in the 1990s, has a hardened, modified case so that it can penetrate some hardened targets, although probably not those encased in steel and concrete. The B61 -Mod 7, along with the Mod-3 and Mod-4, and Mod-10 versions, are a part of an ongoing life extension program (LEP) that will produce a new B61-mod 12 bomb. |103| According to the NNSA, the B83, the largest bomb remaining in the U.S. arsenal, is likely to be retired around 2025, after the completion of the B61 LEP. The Obama Administration strongly supported the life extension program for the B-61 bomb in the Nuclear Posture Review. The report indicated that "the Administration will fully fund the full scope LEP study and follow-on activities for the B61 bomb ... to ensure first production begins in FY2017." The NPR noted that the life extension program for the B61 bomb, which would include enhancing safety, security, and use control, would also support U.S. extended deterrence goals by allowing the United States to retain the capability to forward-deploy U.S. nuclear weapons on B-2 bombers and tactical fighter-bombers. |105| In the years since the NPR, however, the costs for the program have risen sharply and the timeline has slipped. Where DOE initially claimed that the program would cost around $4 billion, it now estimates the cost to be over $8 billion. |106| In addition, it now expects the first unit to be available in 2020, rather than 2017. Some in Congress have challenged the Administration's plans for this program, asking whether a less costly and complicated program might be sufficient. The Obama Administration claimed, however, that if it pursued a less complex life extension program now, it would need to initiate a second program a few years later to complete the remainder of the work. Moreover, the Obama Administration noted that, after it completes this program, DOE will be able to retire the much larger B83 bomb and reduce the number of B61 bombs in the U.S. stockpile. The Air Force is also designing a new tail kit for the B61 bomb. This tail kit would replace the parachute that the bomb currently uses to slow to its targets, and would improve the accuracy of the weapon. Some analysts claim that this tail kit would provide the bomb with new capabilities, and would undermine the Obama Administration's pledge that it would not develop new military capabilities as it conducted the warhead life extension programs. |107| Others, however, dispute this conclusion. They note that the new B61 -12 will combine an increase in accuracy with a reduction in yield, allowing it to accomplish the same mission as the current unguided, but higher yield, weapon. As a result, the Air Force has argued that the tail kit will allow the modified B61 bombs to meet operational requirements for the bomber fleet and provide "nuclear assurance to U.S. allies in Europe." Congress appropriated $537 million for the B61 LEP in FY2014, $643 million in FY2015, and an additional $643.3 million in FY2016. The Obama Administration has requested $616 million for FY2017. Funding for the tail kit program has begun to increase in recent years. Congress appropriated $148.2 million in FY2015 and $212.1 million in FY2016. The Air Force has requested an additional $137.9 million for FY2017. According to Air Force budget documents, this request was reduced by $40.9 million to account for the availability of prior year balances. The Air Force maintains 70 B-52H nuclear-capable aircraft at two bases, Barksdale, LA, and Minot, ND. |109| The B-52 bomber, which first entered service in 1961, is equipped to carry nuclear or conventional air-launched cruise missiles and nuclear-armed advanced cruise missiles. The B-52 bombers can also deliver a wide range of conventional arms, and are currently receiving numerous upgrades to their communications and electronics systems. The Air Force has proposed cutting the B-52 fleet on many occasions in the last 15 years. For example, when the United States identified the force structure that it would deploy under the START Treaty, it indicated that it would only seek to retain 76 B-52 bombers. Congress, however, rejected the Clinton Administration's proposal, and the United States retained the full fleet of 94 aircraft. The 2006 Quadrennial Defense Review called for a significant change to the B-52 fleet, reducing it from 94 to 56 aircraft. The budget request for FY2007 indicated that the Air Force planned to retire 18 bombers in FY2007 and 20 in FY2008. At the same time, the QDR called for continuing improvements to the B-1, B-2, and B-52 bombers' conventional capabilities using the funds that were saved by the retirement of the 38 aircraft. The Air Force has argued that it can reduce the number of deployed bombers, without reducing the overall capabilities of the bomber fleet, because these new weapons have "raised the efficiency" of the bomber platform. At hearings before the Senate Armed Services Committee, General James E. Cartwright, the Commander of STRATCOM, noted that "the next generation weapons that we're fielding, these air-launched cruise missiles, the joint direct attack munitions, et cetera, are much more efficient than they were in the past." |110| General Cartwright also indicated that, in spite of the reduced size of the fleet, the Air Force would continue to deploy B-52 bombers at two bases. During the FY2007 budget cycle, Congress rejected the Pentagon's proposals for at least part of the B-52 fleet. The House, in its version of the FY2007 Defense Authorization Bill, prohibited the Air Force from retiring any of the B-52 aircraft, and mandated that it maintain at least 44 "combat coded" aircraft until the Air Force began to replace the B-52 with a new bomber of equal or greater capability. It stated, as a part of its rationale for this rejection, that it appeared the reduction was based on the reduced need for nuclear-capable bombers and did not take into consideration a growing need for long-range conventional strike capabilities. |111| The Senate agreed to permit the Air Force to retire 18 B-52 aircraft, but stated that it expected no further reduction in the size of the force, noting that a further reductions might "prevent our ability to strike the required conventional target set during times of war." |112| The conference committee (H.R. 5122, �131) combined these two provisions, allowing the retirement of no more than 18 aircraft after the submission of a report, and mandating that the Air Force retain at least 44 "combat coded" aircraft. These restrictions are to remain in place until 2018, or until a new long-range strike aircraft "with equal or greater capability than the B-52H model aircraft" attained initial operational capability, if that occurred first. Congress also stated that no funds could be spent to retire any B-52 aircraft until the Secretary of the Air Force submitted a report to Congress that described the Air Force plan for the modernization of the B-52, B-1, and B-2 bomber fleets; how many bombers would be assigned two nuclear and conventional missions if the United States had to execute "two overlapping 'swift defeat' campaigns"; a justification of the cost and projected savings of any reductions to the B-52H bomber aircraft fleet; and the life expectancy of each bomber aircraft to remain in the bomber force structure and the capabilities of the bomber force structure that would be replaced by a new bomber aircraft. The Air Force indicated that the report on the bomber fleet would be ready in the fall of 2007. Further, in testimony before the Armed Services Committee, the Air Force indicated that it still planned to reduce the B-52 fleet to 56 aircraft, with 32 combat coded aircraft included in the fleet. But, in recognition of the congressional mandate, it was seeking a way to maintain 44 combat coded aircraft, the minimum set by Congress, within the smaller fleet of 56 aircraft. It also stated that it planned to store the 20 aircraft it wanted to retire in FY2008 on ramps at Barksdale Air Force Base; the aircraft would be kept in serviceable condition, but would not receive any capabilities upgrades. |113| Congress once again rejected this proposal. In the FY2008 Defense Authorization Bill (H.R. 1585, �137), Congress mandated that the Air Force maintain a fleet of 74 B-52 bombers, with no less than 63 in the Primary Aircraft inventory and 11 backup aircraft. Two additional aircraft would be designated as "attrition reserve." The conference committee indicated that the members agreed that a fleet of fewer than 76 aircraft would be insufficient to meet long-range strike requirements. The growing interest in long-range strike capabilities, and the continuing addition of precision conventional weapons to these aircraft, demonstrates that the Pentagon and STRATCOM view the U.S. bomber fleet as essential to U.S. conventional weapons capabilities. Further, the need for long-range strike capabilities, rather than an interest in maintaining the nuclear role for bombers, |114| appeared to be driving decisions about the size and structure of the bomber fleet. There are some indications that, during the discussions on the 2006 QDR, some in the Pentagon argued that the all the B-52 bombers should be removed from the nuclear mission. Moreover, in November 2008, Secretary of the Air Force Michael Donley noted that the role that the bombers play in nuclear deterrence could be reduced in the future, if the United States and Russia negotiate further reductions in their nuclear arsenals. This focus began to shift, however, in 2008. Studies have noted that a lack of attention paid in the Air Force and, more broadly, in DOD, to the bombers' nuclear mission seems to be one of the factors that led to the episode in August 2007, when a B-52 bomber flew from Minot to Barksdale with six cruise missiles that carried live nuclear warheads. |115| As is discussed in more detail below, the Air Force is pursuing a number of organizational and procedural changes to increase its focus on the nuclear mission and "reinvigorate" its nuclear enterprise. It has "stood-up" a B-52 bomber squadron that will focus specifically on the nuclear mission. |116| This unit added 10 bombers to the 12 already deployed at Minot. While all the B-52 bomber crews and aircraft will retain their nuclear roles, this added squadron will participate in a greater number of nuclear exercises and training missions. The aircraft in the squadron will rotate from other missions, but will remain designated as the nuclear squadron for full year. The Air Force hopes this construct will improve not only the operational proficiency of the crews, but also their morale and their confidence in the value of the nuclear mission. The B-52 bomber was equipped to carry both the Air-Launched cruise missile (ALCM) and Advanced Cruise Missile (ACM). The ACM reportedly had a modified design with a lower radar cross-section, making it more "stealthy" than the ALCM. According to Air Force figures, in 2006, the United States had 1,142 ALCMs and 394 ACMs. |118| Although these weapons represented a majority of the weapons that U.S. bombers could carry on nuclear missions, the Department of Defense decided to retire many of these missiles. In his statement to the Senate Armed Services Committee's Subcommittee on Strategic Forces, Major General Roger Burg indicated that this study had concluded, and the Secretary of Defense had directed, that the Air Force retire all the Advanced Cruise Missiles, although some could be converted to carry conventional warheads, and reduce the ALCM fleet to 528 cruise missiles. The excess ALCMs would also be eliminated, with the remaining missiles consolidated at Minot Air Force Base. With all the ALCMs consolidated at Minot Air Force Base, the bombers at Barksdale may no longer be included in the nuclear mission. The Air Force plans to sustain the ALCM in the fleet through 2030. It is then planning to replace the ALCM with a new advanced long range standoff (LRSO) cruise missile. It completed an analysis of alternatives (AOA) for this system to "define the platform requirements, provide cost-sensitive comparisons, validate threats, and establish measures of effectiveness, and assess candidate systems for eventual procurement and production" of the new missile. |119| The DOD budget request for FY2014 contained $5 million for the Air Force to begin systems engineering support for the program. The budget also indicated that the technology development phase would begin in FY2014, and that the funding requests could reach a total of $1 billion through FY2014. In the FY2015 budget request, DOD indicated that the plans for the LRSO missile had slipped by three years. This change was the result of fiscal constraints and the need to fund higher priorities elsewhere in the nuclear force. As a result, although the Air Force requested only $4.9 million for this program in FY2015, it indicated that it would spend $221 million over the next five years. Congress expressed concerns with this plan in the FY2015 National Defense Authorization Act (P.L. 113-291, �143), noting that the existing ALCMs were, on average, over 30 years old and that the capabilities provided by the cruise missile were "critical to maintaining a credible and effective air-delivery leg of the nuclear triad." The legislation requested a report on the status of the current cruise missile and the development of the new LRSO missile. In its FY2016 budget request, the Air Force added funding for the LRSO to accelerate the program by two years, seeking now to begin deployments in the mid-2020s. According to testimony, the Air Force had placed a higher priority on this program because the existing ALCM has been through several life extension programs and is beginning to show reliability problems. According to Frank Kendall, the Under Secretary of Defense for AT&L, this is making the ALCM more difficult to maintain. |120| Where the Air Force requested only $3.4 million for this program in FY2015, it requested $36.6 million in FY2016. DOD expected this funding to increase rapidly, to a total of nearly $1.8 billion between FY2016 and FY2020. Congress appropriated only $16.4 million for the LRSO in FY2016, reducing the request by $20.5 million due to delays in the award of the contract that reduced the budget requirements for the program. The Air Force requested $95.6 million for the LRSO in FY2017; Congress approved this amount FY2017 National Defense Authorization Act (P.L. 114-328). According to DOD's budget documents, the Air Force plans to request $419.8 million in FY2018 and a total of $2.1 billion between FY2018 and FY2021. This indicates that the Air Force is now committed to accelerating and completing the program. According to press reports, the Air Force plans to buy a total of 1,000-1,100 new cruise missiles through the LRSO program, at a cost of around $10.8 billion, with the first missile slated for completion in 2026. |121| This total would support the testing program and deployment plans over the life of the missile. NNSA is also conducting a life-extension program on the W80 warhead to provide a warhead for the new LRSO. Its plans for the W80-4 warhead had also slipped in the FY2015 budget, with the Nuclear Weapons Council delaying the first production unit from 2024 until the 2025-2027 timeframe. Congress, in the FY2015 National Defense Authorization Act, mandated that NNSA deliver the first production unit of this new warhead by 2025 (P.L. 113-291, �3119). In its FY2016 budget request, NNSA indicated that it had allocated the resources necessary to meet this requirement, and to align the warhead life extension program with the plan to field the first LRSO missile in FY2026. Congress appropriated $195 million for the W80-4 life extension program in FY2016, and NNSA has requested $220 million in FY2017. According to NNSA budget documents, it expects to request nearly $2 billion for the W80-4 LEP between FY2018 and FY2021. Cruise missiles provide capabilities that complement rather than duplicate that of a stealth bomber. Standoff capability improves the survivability of our bomber fleet, extends its effective range, and multiplies the type and number of penetrating targets each bomber presents to the adversary. This complicates the air defense problem facing any country seeking to negate this portion of our deterrent. As the preceding discussion noted, the United States currently deploys two types of heavy bombers–the B-2 and B-52–that can deliver both nuclear and conventional weapons. A third bomber, the B-1, was initially equipped to deliver nuclear weapons but is now exclusively dedicated to conventional missions. The Air Force has employed all three aircraft in conventional conflicts over the past two decades, and all have received upgrades to sustain their capabilities, but all three are aging and, according to many in the Air Force, may not be sufficient to meet emerging challenges. This dispute revealed wide-ranging differences, within the Air Force and Pentagon, about the goals for and capabilities that should be sought in a new bomber program. |128| The dispute focused, however, on conventional capabilities; it seemed to be almost a foregone conclusion that nuclear capabilities, or the need for a bomber leg of the nuclear triad, would not drive the discussion or analysis. This position remains true today, with the Air Force seeking a new bomber to meet conventional challenges, and considering delaying the introduction of nuclear capabilities to save money. But disagreements over the capabilities needed, even for the conventional mission, served to delay the new bomber program by several years. In May 2007, the Air Force indicated that it had decided that the next generation bomber would be manned and subsonic, although it would incorporate some stealth characteristics. |129| It decided that it would not pursue supersonic capabilities, or an unmanned option, to contain costs and maintain the capabilities of the future aircraft. However, on April 6, 2009, in a briefing describing the FY2010 defense budget, Secretary of Defense Robert Gates delayed the program and indicated that the Air Force would not proceed until it had "a better understanding of the need, the requirement and the technology." |130| He suspended the program until DOD completed the QDR and Nuclear Posture Review. The update to the 1251 Report, submitted to the Senate before its vote on the New START Treaty in late 2010, emphasized that the United States would maintain the bomber leg of the strategic triad and that DOD was committed to modernizing the bomber force. The report noted that the long-range strike study was not questioning whether the United States would pursue a new heavy bomber, but "the appropriate type of bomber and the timelines for development, production, and deployment." |134| The report indicated that this study would advise the President's budget submission for FY2012. Air Force officials echoed this, noting that Secretary Gates seemed inclined to accept the Air Force's recommendations on the building of a new long-range bomber. |135| Secretary Gates confirmed this approach in January 2011, when he announced the Air Force would develop a new bomber "using proven technologies," and that this bomber would be nuclear-capable. |136| The Pentagon requested $197 million in the FY2012 budget on a new bomber. The budget documents indicate that the bomber will be nuclear-capable, and that the Air Force was planning to spend $3.7 billion on its development over the next five years. Air Force officials indicate that they hope to field between 80 and 100 of the new bombers, now known as the B-21, in the future, with the first to enter service around 2025. It indicated that it planned to hold the procurement cost for each bomber to $550 million, with the total cost of the program to reach $36 billion-$56 billion. However, it acknowledged, in 2014, that this cost did not include research and development funding, |137| which, according to some estimates, could amount to between $20 billion and $45 billion if the program follows the trends set by previous bomber programs. |138| The per-unit cost would also rise if the Air Force were to buy fewer than the planned 80-100 bombers. As a result, many analysts agree that the final cost of the bomber could reach $60-$80 billion. The Air Force expects funding requests for the new bomber to rise sharply in the coming years. Congress appropriated $259 million for R&D on this aircraft in FY2013, $359.4 million in FY2014, and $913.7 million in FY2015. These requests are sufficient to keep the bomber program on track but lead to Air Force spending levels that exceed the levels set by the 2011 Budget Control Act. According to one recent analysis, the Air Force would likely need to reduce its other acquisition programs to find the "budget headroom" for this program. |139| The Air Force requested $1.3 billion for FY2016, but Congress appropriated only $736 million. According to Air Force budget documents, this reduction reflected schedule delays in the program and the awarding of the contract. The Air Force has indicated that a new bomber is essential to its future plans for the conventional long-range strike mission. It has stated that it is "committed to modernizing bomber capacity and capabilities to support LRS (long range strike) military options." It indicated that the new bomber "must be able to penetrate the increasingly dense anti-access/area denial environments developing around the world." The Air Force has, in the past, stated that this bomber will be designed to deliver nuclear weapons. However, in October 2011, the Chief of Staff of the Air Force indicated that the new bomber probably would not include nuclear capabilities initially, but would add them in as the B-2 and B-52 bombers retired from the fleet. In late August 2007, a B-52 bomber based in Minot, ND, took off on a flight to Barksdale Air Force Base in Louisiana. The bomber carried 12 air-launched cruise missiles that were slated for retirement at Barksdale. As a result of a series of errors and missteps in the process of removing the missiles from storage and loading them on the bombers, six of the missiles carried live nuclear warheads, instead of the dummy warheads that were installed on missiles heading for retirement. This episode was the first of many that have led to questions about the capabilities management of the U.S. nuclear weapons enterprise. It led to a series of studies and reviews by the Air Force that identified the source of the episode and identified a number of steps the Air Force should take to improve its handling of nuclear weapons. |142| These studies were followed, in 2014, by additional studies and a number of changes designed to raise morale and the quality of life for servicemembers in the nuclear enterprise. Several of the studies that reviewed this event concluded that the Air Force leadership had lost its focus on the nuclear mission as it diverted resources to more pressing missions related to the ongoing conflicts in Iraq and Afghanistan. As a result, the "nuclear enterprise" had been allowed to atrophy, with evident declines in morale, cohesion, and capability. |145| These reports suggested that the United States restore its focus on the nuclear mission and repair long-standing and often-identified deficiencies in manpower and training programs for crews that maintain and service nuclear weapons and operate nuclear-capable bombers. The studies identified a number of organizational changes to achieve these goals. For example, the Air Force has created a new Global Strike Command, based at Barksdale Air Force Base, that is responsible for both the ICBM force and the nuclear-capable bombers. This organization began its operations in early 2009. The Air Force has also established a new headquarters office in the Pentagon that will monitor and manage the resources and policies dedicated to the nuclear mission. The Air Force also altered its inspection program and its expectations for achievement during these inspections. Several incidents that occurred in 2013 and early 2014 have raised new concerns about the capabilities and morale of ICBM launch officers. For example, press reports from May 2013 noted that the Air Force had removed 17 launch officers from duty at Minot Air Force Base and had sent them for additional training after they earned low scores on an inspection in March. |149| In August, a missile unit at Malmstrom Air Force Base also received a failing grade on an inspection. Air Force officials expressed concern about these results, but noted that they remained confident in the capabilities of Air Force nuclear officers. After the incident in Minot, some saw the commander's response, and the remedial action, as a sign of progress in the force, because problems were identified and corrected on site. Others have noted that unsatisfactory results in inspections may be the result of higher expectations, and do not necessarily indicate deeper problems. Others, however, view the low scores on inspections as a symptom of continuing problems in the force. The Air Force has responded to these problems with plans to increase funding by nearly $8 billion over the next five years, raise pay levels, introduce new management positions, modify the testing process, and raise morale among Air Force ICBM officers. Many of these plans are designed to highlight the high value that Air Force places on the ICBM mission and to convince airmen that their leaders value their effort and accomplishment. At the same time, though, the changes will require additional funding, and the Air Force will need to request increases in its budget in an era of fiscal restraint to follow through on these initiatives. While the Air Force has worked to increase the level of attention and accountability for its nuclear weapons after these incidents, other analysts found different lessons in the lapses. 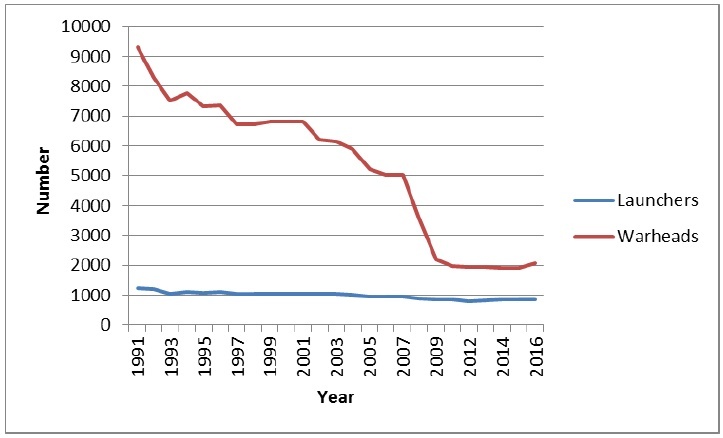 Some saw the decline of the Air Force nuclear enterprise as an inevitable part of the declining role of nuclear weapons in U.S. national security strategy and argued that the United States should extend the process by further reducing its nuclear arsenal and removing greater numbers of weapons from the operational force. For example, some suggested that the evident weaknesses in the Air Force's procedures argued for removing nuclear weapons from the whole of the bomber fleet. |152| Congress may address concerns about these issues, and review possible changes in command structures and security procedures, as it reviews nuclear weapons policies and programs. This report focuses on the numbers and types of weapons in the U.S. strategic nuclear force structure. It does not address the broader question of why the United States chooses to deploy these numbers and types of weapons, or more generally, the role that U.S. nuclear weapons play in U.S. national security strategy. This question is addressed in other CRS reports. |153| However, as the new Trump Administration reviews and possibly revises the plans for U.S. nuclear force structure, Congress could address broader questions about the relationship between these forces and the role of nuclear weapons. The Trump Administration will likely address similar questions about the size of the U.S. nuclear arsenal. It is not clear, at this point, whether the President would support further reductions in U.S. nuclear weapons, although, he did, in one interview in January 2017, state that nuclear warhead numbers were too high. He has also, however, stated that the United States should expand and strengthen its nuclear arsenal. Congress has also offered its support for the retention of the nuclear triad. The FY2017 National Defense Authorization Act (P.L. 114-328, Sec. 1671) states the modernization of the nuclear triad is a key element "in support of a strong and credible nuclear deterrent." The Trump Administration is also likely to continue to support the nuclear triad. Although, as a candidate, President Trump seemed unfamiliar with the concept of the triad, Secretary of Defense Mattis offered his support during his confirmation hearings in January 2017. As the Obama Administration outlined plans to modernize and replace the delivery vehicles in all three legs of the strategic triad, many analysts began to question whether the United States could afford to retain the triad and whether it could retain a robust deterrent without one of the current types of strategic delivery vehicles. |162| Specifically, some have called for reductions in or even the elimination of the U.S. ICBM force. Some have argued that the Air Force could save up to $360 million per year if it reduced the ICBM force to 300 missiles. |163| Others have noted that, under the current financial pressures, the Air Force may not be able to afford a new ICBM after 2030. Moreover, even if the financial pressures did not exist, some argue the Air Force should eliminate the ICBM force because it no longer serves U.S. national security needs. For example, in a study published in May 2012, |164| the Global Zero Organization argued for the elimination of the ICBM force because it views these missiles as dangerous and destabilizing in the current security environment. It noted that "ICBMs can only support nuclear wartime operations against Russia" and that current-generation ICBMs "fired from the existing bases, on their minimum energy trajectories," have to overfly Russia and China or fly near Russia to reach targets in potentially adversarial countries. It contends that, if U.S. missiles fly over or near Russia on their way to more southerly targets in Iran or Syria, Russia might be confused by ambiguous attack indications and might then launch its own retaliatory attack against the United States. Second, the report asserted that, because ICBMs are based in fixed silos that are vulnerable to destruction in an attack, they must depend heavily upon "launch on warning" to survive and retaliate in some scenarios. As a result, according to the report, ICBMs exacerbate the risk that the United States might launch its weapons on false warning. Recently, former Secretary of Defense William Perry also questioned the future need for the ICBM force. He noted that ICBMs are not an essential part of the U.S. nuclear deterrent because the bomber force and SSBN force are sufficient to promise an overwhelming response if the United States is attacked. Specifically, he said that "any sane nation would be deterred by the incredible striking power of our submarine force." |165| He suggested that the United States could keep its ICBM force for a number of years, but that he would not recapitalize it through the GBSD program. The Obama Administration has indicated that the United States would retain 14 Trident submarines until it begins retiring the Ohio-class SSBNs in the late 2020s. Moreover, the New START Treaty allows the United States to continue to reduce the warheads on each missile. It also allows the United States to eliminate some of the launch tubes by simply removing the gas generators that assist in the launch of the missiles. As a result, the United States will have a significant amount of flexibility in apportioning warheads among its SSBNs, and will not have to eliminate any submarines to meet the new START limits. Moreover, the Navy does not plan to alter the basic structure of its Trident fleet; it will continue to deploy its submarines at two bases, with a portion of the fleet deployed in the Atlantic Ocean and a portion deployed in the Pacific Ocean. As a result, with its ability to remain invulnerable to detection and attack, and with the increasing accuracy and reliability of its missiles and warheads, the Trident fleet will continue to represent the "backbone" of the U.S. nuclear force. Some argue that the United States should reduce the size of its SLBM fleet and retain only 8 or 10 submarines. They argue that this reduction now, and the future acquisition of fewer replacement submarines, could save the Navy $6 billion-$7 billion over the next 10 years. |168| They also note that this change need not reduce the number of operational warheads on SLBMs, because the United States would deploy each submarine with 24 missiles, rather than the 20 planned under New START, and could increase the number of warheads on each missile. However, with so few submarines, the United States might have to eliminate one of its submarine bases, leaving it with submarines based only in the Atlantic or only in the Pacific Ocean. Or the United States might have to reduce the number of submarines on station, and, therefore, the number of warheads available to the President promptly, at the start of a conflict. These changes may not be consistent with current submarine operations and employment plans. President Obama and the U.S. military may want to consider the implications of these basing, operational, and policy changes, before deciding whether or not to reduce to 1,000 warheads, as opposed to choosing the warhead number first then deciding later how to base and operate the remaining nuclear forces. In addition to debating the value of each of the legs of the nuclear triad, some analysts have addressed questions about whether the United States should develop and deploy new types of nuclear weapons in response to the challenges posed by emerging nuclear adversaries. Attention has focused, in particular, on lower-yield weapons. Some argue that these weapons would strengthen deterrence by giving the United States more limited, tailored, and, therefore, credible options for nuclear use than are currently available with higher-yield weapons. |173| Others, however, argue that the deployment of low-yield nuclear weapons could undermine deterrence and make nuclear war more likely, because they might be seen as a more "usable" nuclear weapons. When the Obama Administration submitted the 1251 report to the Senate during the New START ratification process, it indicated that it expected to spend around $210 billion over the next 10 years (2011-2021) to maintain and modernize the U.S. nuclear arsenal. This total, however, did not include most of the costs of producing and procuring the next generation of submarines, bombers, and missiles, as these activities would occur after the timeframe contained in the report. Moreover, it became evident, as Congress reviewed the Administration's plans to modernize the nuclear enterprise, that it was difficult, if not impossible, to determine how much the United States spent each year on nuclear weapons, as the funding was divided between the Department of Defense and the Department of Energy, and, in many cases, was combined with funding for other, non-nuclear activities. In other words, the United States does not maintain a single, unified budget for nuclear weapons and other nuclear activities. In response to both the growing concerns about the pending costs of nuclear weapons modernization programs and the confusion about how to calculate the annual costs of the nuclear enterprise, Congress directed the Congressional Budget Office (CBO) to estimate the costs of U.S. plans for operating, maintaining and modernizing nuclear weapons, the delivery systems, and the DOE nuclear weapons complex over the next 10 years. CBO issued its report in late 2013. |176| It found that the United States was likely to spend $355 billion over the next 10 years on its nuclear weapons enterprise. This total included $56 billion for command, control, communications, and early warning activities and $59 billion for additional costs based on historical cost growth of similar programs. Neither of these categories had been included in the Administration's estimate in 2010. When CBO considered the same categories as the Administration, it estimated 10-year spending of $241 billion, a number close to the estimate provided by the Administration. CBO updated its estimate in January 2015, and reported that it calculated that the United States would spend $348 billion between 2015 and 2024; excluding command and control and cost growth, the total that was comparable to the Administration's 2010 estimate was now $247 billion. While there now appears to be a broad base of agreement about the magnitude of the costs that the United States is likely to incur as it modernizes its nuclear arsenal, there is little agreement about whether the United States can, or should, proceed with all of these programs. Many analysts have noted that, with the passage of the Budget Control Act in 2011, the amount of funding available for defense spending will be nearly $1 trillion lower than expected when the Obama Administration first outlined the nuclear modernization program. In this environment, rising costs for nuclear weapons programs are likely to cut into funding for other Pentagon priorities.